Last year for Christmas, I sent Santa this letter. I want a mascara that gives me long luscious lashes that will blow hot hunks away with a single bat. I also want it to be smudge proof, water resistant and of course it has to hold the curl. Can you also make it beneficial to my lashes? 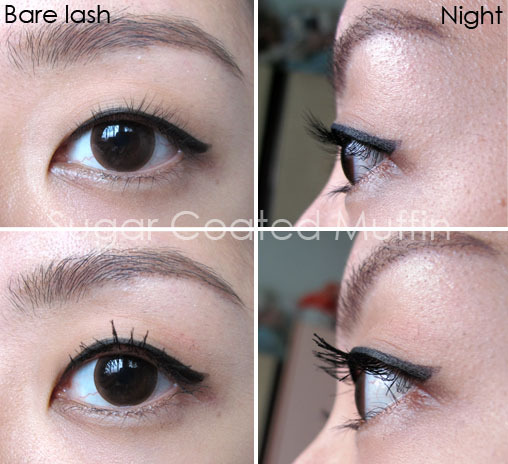 If possible, I want it to be double sided too, so I can choose to have long lashes, thick lashes or have both. Well, I never got that mascara.. I guess he just couldn't find such a great mascara. Or I've been bad. Then suddenly Santa Empro gave me this wonderful magical wand that changes your lashes from meh.. to BAM! And it has all the properties of the mascara I asked for! I wish the tube was prettier though.. Plain white doesn't really work for this mascara. Maybe I'll write Santa Empro a letter this year. The Day wand has an hour glass shape and fibres. However, I have not experienced fibres falling into my eyes. The Night wand is thinner and does not contain fibres. 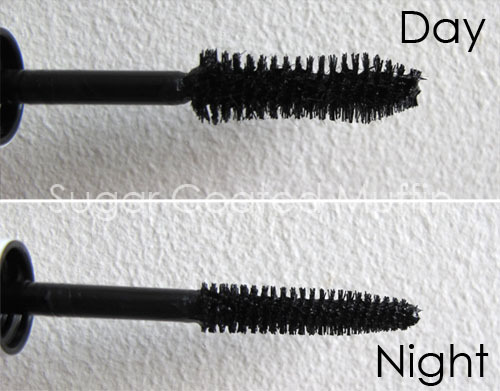 Because of the different formula & wand, the Night mascara gave a different result. It packed on more volume without clumping. However, it was too heavy for my lashes and caused them to droop =( I could have recurled my lashes but I don't like doing that. The Night side may look clumpy but as you can see in this picture, my lashes are separated. The Day + Night does not have as much volume but it's longer and more curled. 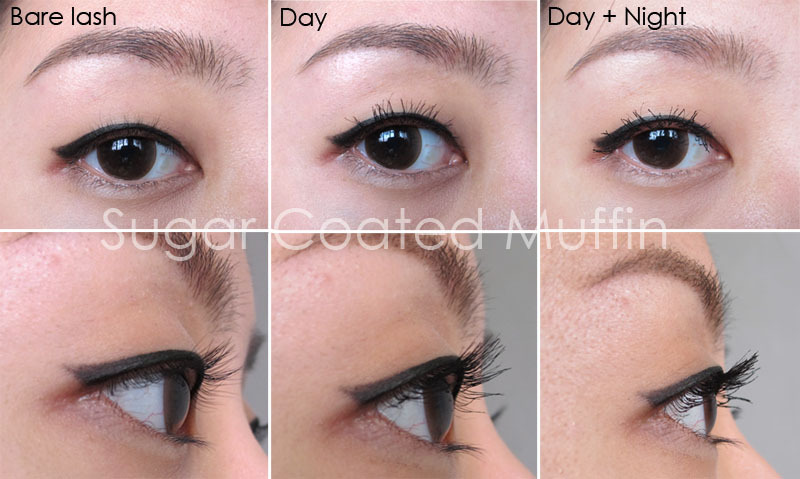 I would say it has the benefits of both mascaras. I'm actually very surprised that my lashes were so fluttery and super soft after applying this mascara. It's not crunchy or hard at all! It looks so natural (compared to other mascaras) and application was a breeze. Also, it doesn't smudge and make my panda eyes darker. Removal was very easy too! In fact, I managed to remove the Day side with ONLY water. Product says : Empro Day & Night Mascara Generation3 is Vitamin E-enriched to strengthen fine eyelashes, providing more elasticity to the lashes while the natural formula works to strengthen the lashes and grow naturally. With a specifically developed brush to outstand the eyelashes, one light stroke is all it takes to effectively curl out every lash separately and thus creating a 3D effect to the eyes, giving more volume to the lashes and making them appear luscious in vibrant colours. This product turns every pair of tired eyes into a magnetic charm. comes in a neat, compact packaging specially designed for your everyday need. Water, Iron Oxides (C177499), Stearic Acid, Acrylates Copolymer, Beeswax, Butylene Glycol, Copernica Cerifera (Carnauba) Wax, Sucrose Postearate Polyvinyl, Alcohol, Triethanolamine, Aminomethyl Propanol, Behenyl Alcohol, Nylon-66, Polysorbate 80, Alcohol, Sorbitan Sesquioleate, Phenoxyethanol, Dimethicone, Aluminium Silicate, Montmorillonite, Methylparaben, Tocopheryl Acetate, Sodium Dehydroacetate, Butylparaben, Disodium EDTA, Propylparaben, Panthenol. Water, Acrylate Copolymer, Iron Oxides (c177499), Copernica Cerifera (Carnauba) Wax, Stearic Acid, Triethanolamine, Acrylates/Octylacrylamide Copolymer, Acacia Senegal Gum, Alcohol, Glycerylabietate, Hydrogenated Polysobutene, Tea Stearate, Beeswax, Paraffin, Glyceryl Stearate, Phenoxyethanol, Dimethicone, Cellulose, Microcrystalline Cellulose, Hydroxyethyl Cellulose, Methylparaben, Propylparaben, Tocopheryl Acetate, Penthenol. My conclusion : The price may seem a little steep but think about it.. You're practically getting 3 mascaras (if you count the Day + Night) and the quality is good =) If I'm working, I'll probably repurchase this ^_^ I like soft fluttery lashes. ** Product was provided by Empro. However, this has not affected my thoughts on the product in any way.